Hi, I am interested in your 2012 Chevrolet Corvette Grand Sport Coupe (stock #1181-NSH) listed on Autotrader for $29,995. I'd like to get more information about this vehicle and confirm its availability. Sports cars just dont get much more awesome than the new Corvettes. They have supercar class performance and looks, advanced features, are comfortable, easy to drive, and have been praised for the quality of their new, high-tech interiors. They are frequently called the worlds best sports-car bargain. This one is presented in a color with an awesome name, Inferno Orange. It has a great shine and the lights really dance off the curves of the car as it moves down the road. Up front, the change from hideaway headlights was a dramatic departure from tradition that first appeared on these C6s. That change along with other aerodynamic improvements, including internal improvements for engine and brake cooling are evident in the scoops at the nose of the hood as well as the large air outlets just under the Grand Sport badge on the front fenders. The Grand Sport also gets the wider track and suspension from the Z06, so you will notice a brake cooling duct and wider rear bodywork to accommodate those upgrades on the rear fenders. The Orange also looks great with the tinted windows, and if you want some wind in your hair, just pop out the body colored Targa top. Open the door and get ready to experience a sleek Black leather interior built with a quality of workmanship you would expect to find in limited production cars from Italy or England, not a production car from America. Then pack that interior full of all the comforts and conveniences one would expect of a modern Sport Luxury car. The sculpted door panel has a nice armrest and switches for power windows, mirrors and locks at your fingertips. Settle into the seats that are wider and more comfortable than ever before for long range cruising, yet offer outstanding side support for spirited driving. A leather wrapped steering wheel feels good in your hands and sits in front of dash with backlit gauges including a 6500rpm redline and speedometer with engine gauges flanking them two on each side. Modern conveniences also include air conditioning, a killer sound system that is FM/CD/satellite and iPod compatible for your listening pleasure. The shifter for the automatic transmission sits in the carbon fiber center console. Pop the hood and you will find a 6.2-liter LS3 V8 engine that pumps out 436 horsepower. A factory cold air system draws air in from the front of the grill and feeds an engine optimized for low end torque and broad band power and exits out a dual exhaust system with quad tips at the rear. That power is sent to the rear wheels through 6-speed automatic and gets to the ground through a suspension that is a race developed and tested system of short/long arms working through lightweight transverse leaf springs with specially tuned shocks that provide the seemingly impossible combination of stunning race car performance along with road car manners. Massive drilled rotors both front and rear are clamped by 6-piston calipers up front and 4-pistons in the rear. The rubber meets the road through 335/30/ZR19s in the rear and 275/35R18s in the front mounted on those sharp looking Grand Sport wheels. Awesome V8 power with a race-bred suspension with a comfortable leather interior with all the modern amenities. 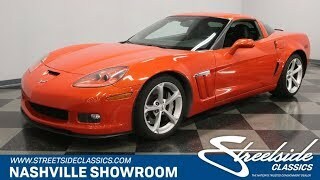 Come on down and check out just how good these newer Vettes really are.